These two piece straps have loop sewn on each end. They work great for slinging coolers and dry boxes in frames. Made from 2000lb. 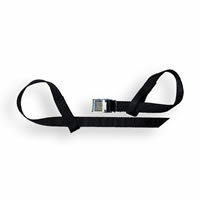 nylon webbing with heavy duty cam buckles with the length of the strap stamped into the buckle. The buckle end is 10 in long and the tail end is 6 ft long.